File this under "Epic Fails: Layers of Editors." National Review's Ramesh Ponnuru submitted a requested column to the Washington Post’s Outlook section. After several rounds of mutually agreed-upon edits, the geniuses at WaPo made a final change without consulting Ponnuru. That change inserted erroneous information into what had been an otherwise clean column. The Post then published two letters to the editor criticizing Ponnuru for the error WaPo had created. That caused Ponnuru to demand a correction, which he ultimately received. 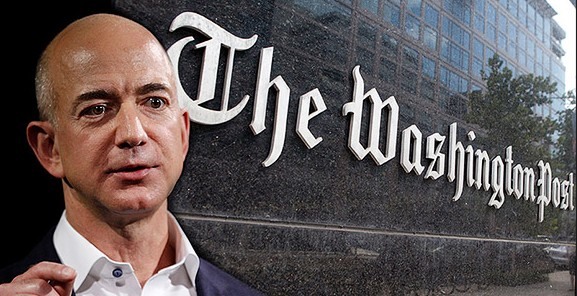 Amazon.com CEO and WaPo owner Jeff Bezos really needs to take a hard look at the leftist koolaid-drinking Keystone Cops operation for which he massively overpaid. Otherwise, the default assumption will be that he's fine with the completely unacceptable status quo. ... No publication has ever behaved as unprofessionally with me. Several weeks ago, the Washington Post’s Outlook section asked me to contribute to its annual “spring cleaning” feature by arguing for getting rid of something. I chose “President’s Day.” The federal government has made the third Monday of February a national holiday marking George Washington’s birthday, but many states and retailers (especially car dealers) have made the holiday into “President’s Day” in the culture. I wrote a few paragraphs suggesting that we should reclaim the proper name of the holiday. It was a few hundred words: no big deal. The article went through several rounds of editing. Between the last time I saw the article and its publication, however, it was changed. My original version read in relevant part: “Getting rid of President’s Day would not be difficult. All we would have to do is start calling the third Monday of February by its proper name under federal law: Washington’s Birthday. That’s the practice state governments and advertisers ought to follow.” The version the Post ended up running struck the third sentence and replaced the second with “All we would have to do is designate the third Monday of February to mark George Washington’s Birthday.” The new language is misleading, since the federal government has already made that designation, and anyone who knew the truth of the matter would think I did not know it. I started getting e-mails correcting my supposed error, which is how I learned that the Post had screwed up. (I ended up getting about two dozen.) I sent the editor with whom I had worked a what-gives e-mail, and she responded that her colleagues had decided that their new language was more accurate than mine and that the difference was too minor to run the change by me. I sent another e-mail explaining that no, the change made the piece less accurate, but also saying I would let it go. I heard nothing back. The Post did finally correct its error. Ponnuru indicated that was inclined to let the matter drop until the letters to the editor appeared. Bad idea, Ramesh. Look, I completely understand that there are only so many hours in a day, but you can never let these clowns get away with stuff like this, especially because the Internet is forever. If he had done nothing, Ponnuru might have found himself ripped for his "ignorance" ten years from now. I have to wonder if the fact that Ponnuru is a conservative is a factor in this stupidity. Given the paper's willingness to run what from all appearances is an orchestrated, completely baseless attack on the Koch Brothers, possibly "at the behest of the Democratic Party" — and its stonewalling reaction to withering criticisms at Powerline accompanied by an apparent refusal to correct its errors — the letter writer's question is sadly legitimate.